Most of you would say you’ve never heard of MELISSA CLARK, but if you’ve opened a cookbook in the last decade, you’ve seen her handiwork. Melissa is a food writer and cookbook author whose “A Good Appetite” column for the New York Times is quite popular. 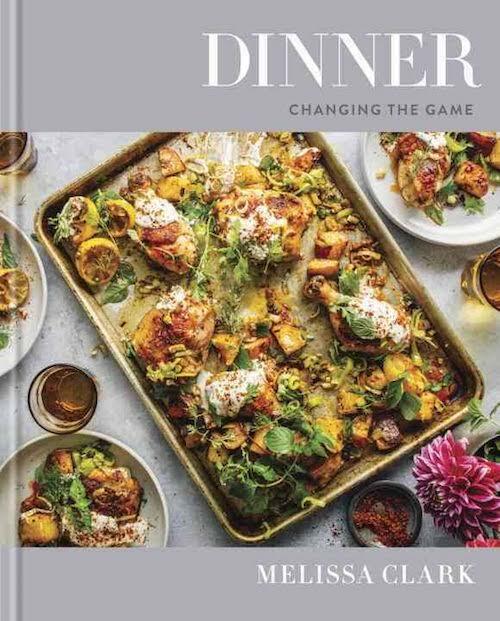 Melissa’s been a cookbook publishing tare the past year, but my favorite is DINNER because the goal was to insure home cooks understand that a great meal can be accomplished in an unfussy way any night of the week. In DINNER, Melissa elevated common dishes with unique ingredients to keep tastes interesting and I’m sharing her delicious roast chicken recipe because everyone loves roast chicken. Place the dry chicken on a sheet pan and season inside and out with salt and pepper. Refrigerate, uncovered, to let the seasoning sink in and the skin firm up for at least 1 hour and up to overnight. Preheat the oven to 450°. Stuff the cavity with the small bunch of herbs and truss the legs. Place in the oven and roast until the skin just begins to brown, 30 minutes. Meanwhile, bring a small saucepan of water to a boil. Slice one of the lemon halves lengthwise, then thinly slice crosswise to make small wedges. Add to the water and boil until softened to remove any bitterness, 1 minute. Drain and transfer to a medium bowl. To the lemon slices, add the chickpeas, olive oil, both paprikas and a large pinch of salt. Remove the chicken from the oven and baste with any juices that have begun to collect in the pan. 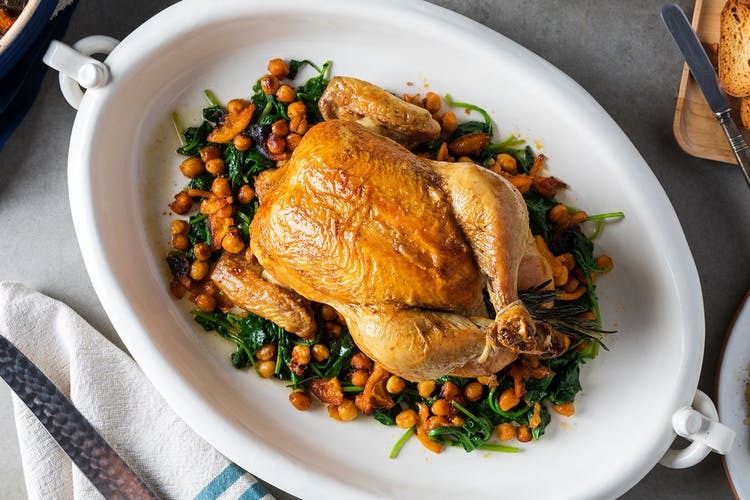 Scatter the chickpea mixture around the chicken and return to the oven to cook until the chickpeas are crispy and the chicken is golden brown and has an internal temperature of 165° when inserted into the thigh with an instant-read thermometer, 20 to 25 minutes more. Transfer the chicken to a cutting board to rest for 5 minutes before carving. Meanwhile, add the kale to the hot pan and toss with the chickpeas until wilted. Squeeze the remaining lemon half on top and season with salt and pepper. Divide the kale mixture between plates, then top with carved chicken and serve.